The one day event was focused on providing a platform for raising awareness of the growing business aviation industry in Nigeria. Hosted by dynamic chair Alasdair Whyte, Editor Corporate Jet Investor, over 100 international attendees representing aircraft owners, OEMs, financiers, aviation regulatory bodies, aircraft management companies, FBOs and charter operators met to engage in lively debate discussing a range of topics. 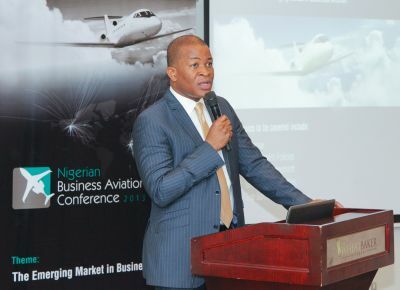 Segun Demuren, MD/CEO of EAN, opened the meeting outlining the need for a better local understanding of the value of business aviation in Nigeria as an economic driver for the country and surrounding regions, and confirmed its significance in developing pan-African and international business. “The business aviation market in Nigeria can only be successful if we have the appropriate infrastructure in place to make it an efficient and valuable business tool”, said Demuren. “By infrastructure we don’t just mean the physical structures, but also the appropriate aircraft finance, management, safety and permits. The actual number of jets based in Nigeria is hard to pin point. Data experts JETNET indicate 86, whilst local experts suggest a figure of 150 jets based and operating within Nigeria. The discrepancy is symptomatic of a young, burgeoning market, but the local figure makes it one of the largest African jet markets. With a proliferation of large cabin and long range aircraft the value is said to top even the established South African business aviation market in numbers. As a European attending business aviation conferences that have been fairly down beat it was refreshing to be in an environment that is worrying about the rapid growth of its sector with main concerns relating how to support the aircraft activity. The Nigerian general aviation industry is expected to grow by about 3.5% over the next year, which follows a 2.5% increase year on year from 2012. Growth is coming from all sectors of aviation except perhaps the commercial sector, but business aviation in particular booming. Bearing in mind that Europe’s growth is pretty much non-existent this is making Nigeria a hot spot for those looking for new sources of income in business aviation. Out on the apron at Lagos airport the latest models from the Gulfstream family sit alongside Dassault Falcons, Bombardier Challengers and Global Express types and increasingly the Embraer Legacy and Lineage families. There is a place for the smaller jets too with over 50 small airports that can serve the turbo prop and light jet community. With the average aircraft sale said to be around US$25m the international OEMs are optimistic about the future in the country. 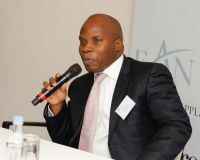 The finance session was led by Segun Agbaje, MD of one of Nigeria’s leading financial houses GT Bank, the platinum sponsor of the event, who discussed the requirements of the bank when considering financing aircraft. Character and integrity of the customer is said to be as important as collateral and assets which is interesting in a country where it is not unusual for clergymen to own executive aircraft. Agbaje also noted that Nigeria had experienced “high octane growth” in the last few years making for a volatile economic environment but this is not deterring the bank’s interest in aviation financing. “We are more used to financing rice and fish so aviation is a good way for us to expand business”, he commented. 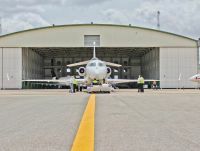 The OEM panel which featured sales directors from sponsors Gulfstream, Embraer and Dassault alongside representatives of Bombardier and Cessna in the region were positive and remain optimistic about the future growth of sales in the region giving at least an eight out of ten when asked where on the scale of sales growth they positioned Nigeria. However the enthusiasm was tempered by the reality that in order to sell aircraft, service centre and maintenance support were major considerations – unsurprisingly as this is also a factor the financiers require. Colin Steven of Embraer underlined the need for support to train and identify local engineering specialists to support the expanding sector. Bringing expats with engineering experience is a start but Africa needs to grow its own skill set to support the expansion. “Don’t learn the hard way”, said Achuzie Ezenagu, MD of Toucan Aviation, a local operator that serves the oil sector. He expressed the need for an increase of aircraft management companies in the region. Again it is hard to be exact but it seems that very few of the aircraft based in Nigeria are using aircraft management companies to supervise the asset. An inexperienced team employed by an enthusiastic owner can leave the aircraft exposed in a number of ways. Management begins three or four months before the aircraft is purchased suggested Ezednagu and advised potential owners to recognise that knowledge of regulations, crewing, paperwork, safety and the capacity to extract value from the asset, will combine to provide valuable support of aircraft operations in a young business aviation sector. With landing permits currently taking between 48 and 72 hours to be granted, Nnamdi Udoh, MD of the Nigerian Airspace Management Authority, said that a transformation agenda was in process and recognised that automation of this important issue would better serve the industry. Plans are in place to implement automation sooner rather than later he continued. Security and safety were also a hot topic with one head of security explaining they have to take as much care of their employees who are regularly threatened as they do of the aircraft and passengers. FBOs need improving but partnership with internationally recognised, established companies will go some way to supporting development and there is hope that the government will initiate training grants to support all these sectors. With the new policy threatening some operations there still remains a long way to go before Nigeria’s business aviation sector matures but as Demuren stated when winding up the day, “Undoubtedly Nigeria is a significant player in the business aviation sector for Africa and will play an important part in the continent’s growth. This conference has demonstrated that whilst we have a lot of opportunity we are still very much in our infancy and must aim to build the infrastructure to support business aviation and the associated framework necessary to create a solid base”.